Growing up on a hobby farm had lots of perks- my first pet was a goat, I can milk a cow like a boss and I know for sure that geese are always the scariest animals on a farm. The down side to our little farm was that my parental units never let us have a horse. And try as you might, cows are not happy when you jump on their back and try to make them race. Trust me on this. So when the Brumby pattern was released it was a no brainer my inner ten year old would make me buy it. So saddle up cowfolk- this fine filly has a new skirt! Yeehaw! The denim is from Tessuti and I grabbed it the day before Sewaway in June. The fabric is the most perfect for me blue denim ever but even after a good wash it is still rubbing off indigo dye everywhere. Eek! Sewing this skirt up was fantastic because my hands were totally Smurf-tastic by the end. Watch out Gargamel! Construction was super easy but I did pick up a few new tricks. To gather the fabric I used a zig zag stitch over dental floss which worked a treat (and left the skirt minty fresh!) This was my second attempt ever at inserting an exposed zip and the included instructions are easy to follow though I wish I had read them all the way through before starting. There may have been an incident with the zip being trimmed when it wasn’t necessary. Oops. Those pockets. Do I need pockets large enough to carry a bottle of wine and two glasses as well as a wheel of cheese? The answer is yes. Always yes. Topstitching fun times! It looks so rad. Exposed zips. Sure, these were super hip back in 2011 but I’m a lady who likes to take time to commit to a style. Bell bottoms are in now, right?! Go down a size in the waistband. When I load up my pockets the skirt drags down to one side. Not a win. Overall, I really love this skirt. It’s ticking all the boxes on my current silhouette requirements plus the denim is going with all of my tees. Sometimes wardrobe basics are what a lady needs! Well, that and paying homage to your bird shirt by pulling out your weirdest phoenix impression. KA-KAW! It seems like a perfect skirt for both work and play! And the pink topstitching brings it all to another level! Love the top stitching on your skirt! This is such a cute pattern. The top stitching totally makes this – all hail the edge stitch foot! That’s such a great skirt! And it’s exactly what is want to do with the brumby pattern, but can’t because I have a big bump in the way! So I’m quite jealous, actually. I’m chuckling imagining you traveling around in with skirt pockets packed with epicurean picnic items. 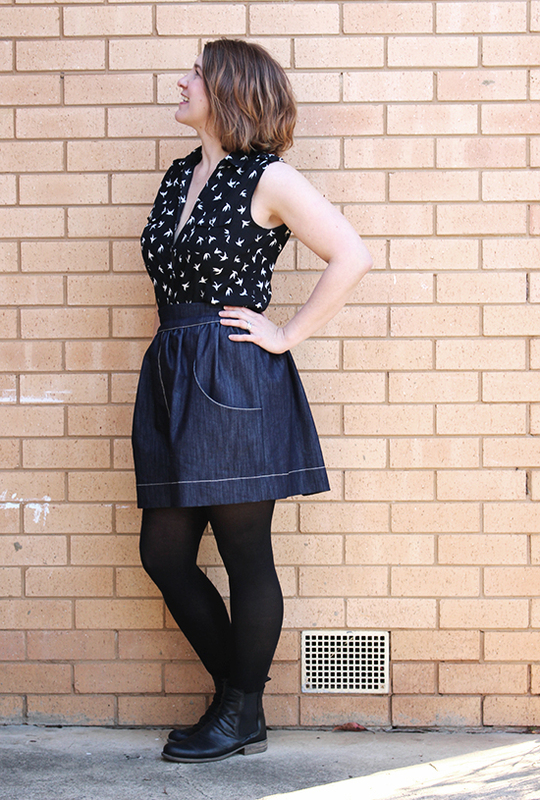 The skirt looks wonderful in your topstitched denim! This is cute, but I think I’ll just have to love it on you- I can’t imagine what this would do to my dainty flanks!! Phew! If you took it away my flanks would be chilled and it still be winter here 😉 Many thanks, milady! So true! It’s why I am off pencil skirts for the mo- I need me some pockets! Look at your awesome top stitching~ and those pockets – YES! Sounds like a great childhood – I can totally imagine you trying to race the cows, and it sounds like fun! We had Dexter cows (https://en.wikipedia.org/wiki/Dexter_cattle) which are these cute little stumpy cows. It was like sitting on a wine barrel! Looking good! 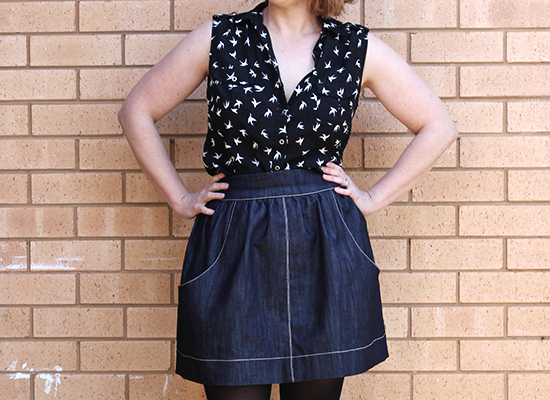 I am really digging denim skirts at the moment. Growing up on a farm would’ve been so much fun. We just went to spend the weekend on my auntys farm and she is getting a dairy cow soon. Next time we go there she is going to teach us to milk it. It is going to be hilarious!!! You had a pet goat?!?! Are you KIDDING me?! I always wanted one but my mom is a jerk! 😀 This is so cute! You’re a total cowgirl! Lady, you continually inspire me to sew. I love this skirt!